Meeting classic Disney characters is an important part of any trip to Walt Disney World. Unfortunately, most greetings mean standing in very, very long lines, sometimes in the hot Florida sun. The meet and greet is then short; a quick picture, maybe an autograph, and a hug. Character dining is a great way to have a more personal experience with the characters. The characters will make sure that everyone has plenty of time with them. A character meal is also a wonderful way to show shy little ones that the characters are not scary. The problem with character meals is that they are expensive. That is why you need to be prepared before your meal. If you and your family walk into the restaurant without having any idea of what to expect, your experience will not be as rewarding. Find out all that you can about the meal before you head to the restaurant. If you know what the food is like and which characters might appear your entire family will be more likely have a great time. You will also want to carefully consider when you have your character meal. Some people like to reserve one for the beginning of the vacation to get the kids used to the characters. Others like to schedule one for the middle of the trip and have it on an “off day” from the parks. A character meal can take a fair amount of time so make sure you will not want to rush through it in order to hit the rides. The time of day can also make a difference. If you schedule an early character breakfast you will still have a full day of fun ahead of you. A character dinner might be overwhelming for exhausted little ones. Only you know what time of day your family will best be able to adapt, so plan accordingly. Most character meals are served either family style or on a buffet. It is a great chance for you and your family to try something a little bit different. If there is a dish on the buffet that you are not sure about, try a little bit. You might find a new favorite food. Do not to take more than you will eat. Part of the reason that buffets cost so much is because people take more food than they want and the extra ends up in the trash. Remember also that you are not going to want to eat as much if you plan on riding something immediately following your meal. Characters that appear at the meals will change from time to time. Don’t make promises to your children on which characters they will see. While it’s a safe bet that Donald will be at Tusker House (it is his safari, after all), they are not all that cut and dry. Disney admits that characters change occasionally. You don’t want your kids to be disappointed. You can tell them that Minnie “might” be at the meal, but don’t promise that she will be. You could decide to let them be surprised. Explain that there will be characters there but don’t tell them who. The element of surprise might help to make the meal more fun for everyone. Communication on several levels is important to make the most of your character meal. First, you’ll need to communicate with your kids. Let them know that most of the characters don’t talk so that they won’t be hurt when Pooh doesn’t answer them. Communicate as well with the characters. This is of course easier with the face characters because they do talk, but it is important for all characters. Tell the character your child’s name. Ask the character for a hug or to sign the autograph book. You will also want to communicate with the character attendant. If your child is shy around the characters let the attendant know. Ask him or her to take a few pictures, even if you’re using PhotoPass. That way you’ll be able to see the pictures immediately. The character attendants might also be able to help you set up the perfect shot. If anyone in your party is having a hard time talking to a character, ask the attendant to help. Chances are that it will not be the first, or last, time that the attendant has seen the problem. He or she will know what to do. If you have special dining needs, ask questions about the food that is served. If you are vegetarian or follow a gluten free diet you will want to find out what is in each dish before you eat it. It is possible to enjoy a character meal if you have special dietary restrictions but you will want to know what you are eating. Disney is very good at accommodating special dining needs so you can easily enjoy a great character meal, even if you’re allergic to peanuts or are watching your fat intake. Character meals are not just for families with small children! Even if you are traveling without any wee ones you should still consider making a character reservation. Who wouldn’t want to head to the beach with Goofy or dine like royalty inside a castle? The characters bring out the kid in all of us. Take advantage of it and make sure that you have just as much fun as the kids around you do. Your pictures will be priceless treasures that you’ll be happy to share with your friends back home. If you are traveling with kids you should also make sure that you enjoy yourself. Your children aren’t the only ones who can sing and dance along with Handy Manny. You know the words, let your inner child come out and play. Too often kids run a little bit wild while at Disney. Parents will let their children do things that they would never do at home. Keep an eye on the kids while at a character meal. Let them know that the characters will be around to greet them as soon as they can, there is no reason for your child to run up to a character as soon as he enters the restaurant. Don’t let small children go to the buffet by themselves. Make sure that they do not take more food than they can eat. Don’t let them run around the restaurant. Having your kids behave is easier said then done, but plan for distractions in between characters if at all possible. One thing that is nice about character dining is that you will have a chance to spend more time with the characters. Make sure that you get the perfect picture! Take several so that each member of your party can have an individual picture with each character, but take a couple of group photos as well. Since the character meals are inside in the air conditioning, you and your family will look cool and comfortable for the pictures. The lighting is good and the atmosphere is fantastic. Take advantage of the setting and get a few pictures that you’ll love. There are plenty of great character meals available at Walt Disney World. Read up on all of them and consider making a reservation for one that is a little bit less popular. The meals at the resort hotels are just as much fun as the ones in the parks and some of the reservations are easier to get. The pace at the hotel restaurants is also a bit more relaxed, which can be a welcome break. Remember too that just because your sister loved Chef Mickey’s does not mean that it will be the best meal for you. Research all of your options to find the perfect meal for your family. You just might be surprised by where you want to dine. Character meals are a great way for shy children to get used to the larger than life figures. Some kids still will not warm up to them. Do not force your child to get close to a character if he or she does not want to. Some kids will become curious about the characters if they have a chance to observe them for a while. Others will not want to go anywhere near them. You will not make lasting memories if your child is terrified. If that is the case, get your own pictures but don’t make the kids do anything that they are not ready for. Some of the character meals are difficult to get reservations for. Make the reservation as far in advance as you can. Disney will allow you to make reservations up to 180 days in advance. As soon as you know when you will be in Orlando, start trying to make that special reservation. If you have to, plan your trip around the more popular experiences; a reservation at Cinderella’s Royal Table is as good an excuse as any to spend the day in the Magic Kingdom! If you can’t make a reservation, keep checking back in case there is a cancellation. Some character meals now require a deposit so people are more likely to cancel if they can’t make it. You might also want to have a backup. 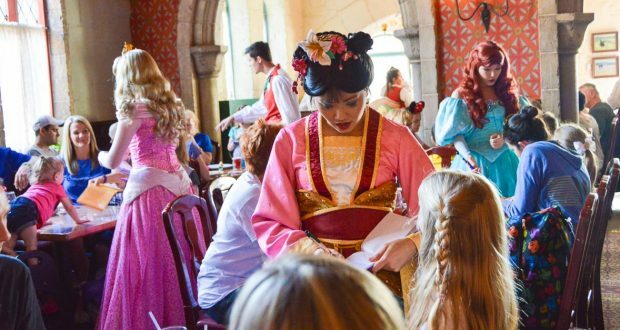 Akershus Royal Banquet Hall, for example, is a great place to dine with princesses if you can’t get a coveted spot with Cinderella, and it’s an easier reservation to make. Remember as well to cancel if you can’t make your own reservation. Disney will send you an email so you won’t forget. If you cancel it will allow someone else to have the meal of a lifetime.